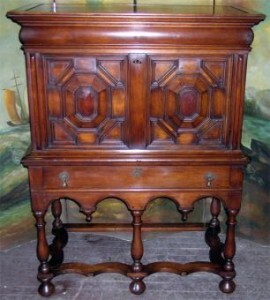 There were many different features in the Jacobean furniture style. Oak was the chief wood and Ash and maple were used for turning and whittling. Using pine wood was also a popular method. There were also a few different types of Jacobean furniture. This included turned chairs, highly carved mirror frames, footstools, and gateleg tables. Upholstery was used to improve chairs. Upholstery is the work of providing furniture, especially seats, with padding,springs,webbing and fabric covers. Materials such as silk, tapestries, crewelwork, linen, velvet, and even leather were used on various types of chairs. There were four different chair styles in the Jacobean era that included three-legged, carver, and Brewster. Almost all flat surfaces on chairs, chests, etc. are carved in low relief. 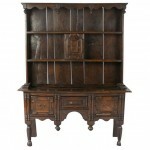 Jacobean furniture was very sturdy, massive in size, notoriously uncomfortable, and made to last. The furniture pieces that were produced consisted mainly of chests, cupboards, trestle tables, wainscot chairs, and gate legged circular tables. Some veneering and inlay were used, and many pieces were painted. Spiral turning was also very popular. Tables were rectangular in shape, with small melon ball turning on the legs. As a rule, Jacobean furniture construction was simple. It was assembled with mortise and tenon joints, held together with pegs.